Hello ... Hello ... my old friends ... It's great to see you once again! 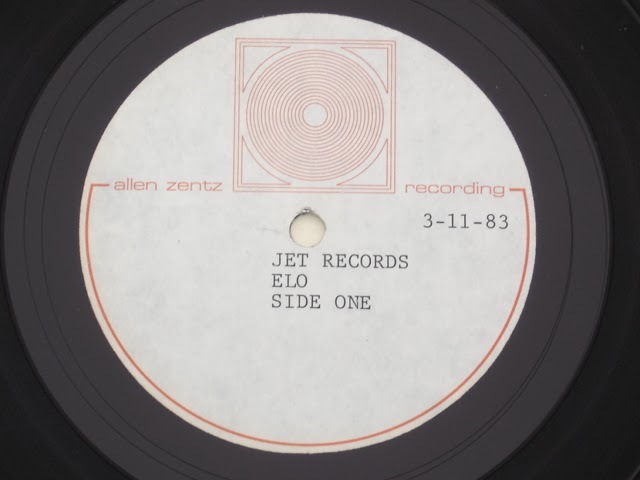 Regular visitors to ELO Beatles Forever [ELOBF] will know that my original goal was to campaign for the release of the original double album, the full 18-track version of ELO's seminal 1983 album "Secret Messages". 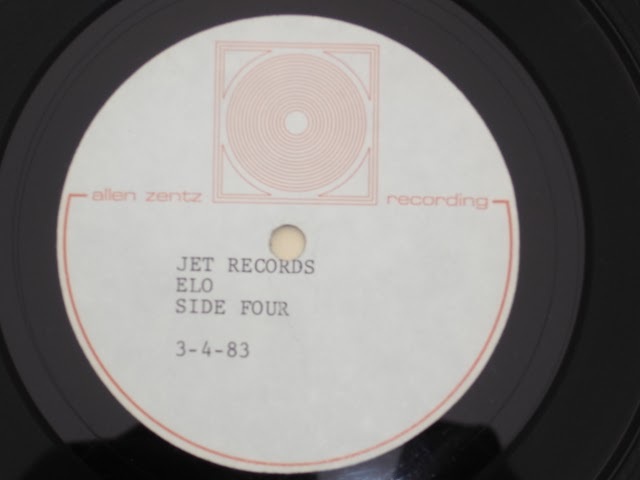 ELO Beatles Forever has indeed expanded in scope over the years but still retains the core goal of seeing and hearing "Secret Messages" [1LP: JETLX527 or 2LP: JETDP402] in all its unedited glory - complete, of course, with "Beatles Forever". "Secret Messages"  "Loser Gone Wild "
 "Bluebird"  "Take Me On And On"
 "Stranger"  "No Way Out"  "Beatles Forever"
 "Letter From Spain"  "Danger Ahead"
 "Train Of Gold"  "Danger Ahead"
 "Endless Lies"  "Hello My Old Friend"
 "Four Little Diamonds"  "Buildings Have Eyes  "Time After Time"
 "After All"  "Rock And Roll Is King"
It really is thrilling to catch a glimpse of the pressing process for the original "Secret Messages" 2LP format. And note that the running order of the second acetate disc is significantly different than that previously thought with a second version/mix of "Danger Ahead" replacing "Mandalay" in this instance. FYI: An acetate is an aluminium disc coated with a fine film layer of nitro-cellulose lacquer. It is cut in advance of a master disc [which is used to mass produce vinyl records] primarily for preview by producers, engineers, artistes and DJ's or to check the quality of the tape to disc transfer. They are sparse because they are often destroyed whether an album is released or canned. 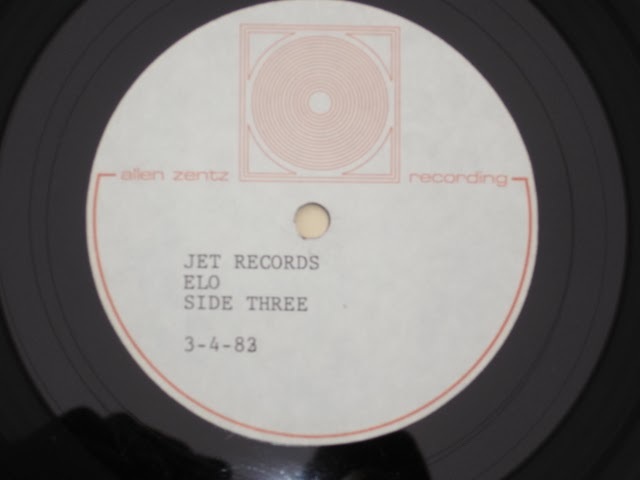 ELO Beatles Forever [ELOBF] continues to hope that Legacy Recordings and Jeff Lynne will continue to consider the full re-release of the original double album, eighteen  track edition of "Secret Messages" and - by extension - the elusive "Beatles Forever". Great update…I never knew the song order before! C'mon Mr. Lynne, it's "TIME" to release this masterpiece to your fans!!!! I think the final price of the auction could be much higher if the pair of discs belonged to the same set. You can have no doubt in the future (we hope soon) your 2-LP edition dream will come true. It´s only a question of time and money. I'd been hoping to see these pictures again, so thanks for sharing them! If my understanding is correct, the first two sides are from Jeff's final approved sequencing of Secret Messages in its original double album configuration. Now, if the rumours of two "unmatched" sets existing are true, that means a very lucky person may still have an acetate including the short mix of After All, which segued into Hello My Old Friend, complete with its full ending as opposed to the Afterglow mix with this section cruelly faded out. I've read in the past from a reliable source that session engineer Bill Bottrell has a safety cassette of the full album, and I'm willing to bet Jeff Lynne has a copy in his possession. 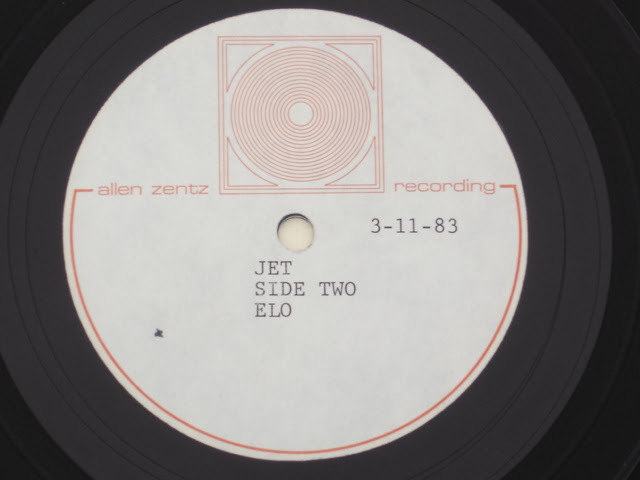 Whether the official ELO archive is home to the digital masters, analogue backups or even just the other acetates, we know Sony had access to the single album in some form in 2000 for the reissue, plus a handful of outtakes such as the 1983 mix for Endless Lies. Obviously, my dream is that the proposed 2CD Legacy Deluxe Edition still happens, even though Secret Messages quietly reached its 30th anniversary last year without any kind of celebration. Ideally, we'd need at least three CDs to store both the single and double tracklistings, not to mention various documented single or alternative mixes of album tracks along with even highlights from The Garden Rehearsals. Who knows what else Jeff has locked away? All three different versions of Beatles Forever, the recordings made at Jeff's house (which, according to Richard Tandy, may include an early take of Hello My Old Friend) and the original Wisseloord demos later completed by Jeff for the Flashback collection in 2000 would all be great to hear, too. Are you listening, Sony?